In the day leading up to the crash of Comair Flight 5191, a federal investigator says the air traffic controller on duty had worked for almost 15 hours and slept for two. Also, a cockpit warning system used by only a few commercial airlines might have prevented the deadly Comair jet crash last weekend if the plane had been equipped with the $18,000 piece of technology, a former top federal safety official said Thursday. "To have 49 people burned up in a crash that is totally preventable is one of the worst things I have ever seen, and I've seen almost everything in aviation," Jim Hall, former chairman of the National Transportation Safety Board, told The Associated Press in a telephone interview from his home in Chattanooga, Tenn.
National Transportation Safety Board member Debbie Hersman, the lead investigator in the crash that killed 49 people, said in her final briefing before leaving Lexington Thursday that the controller had only nine hours off between work shifts Saturday at Blue Grass Airport. That was just enough to meet federal rules, which require a minimum of eight hours off between shifts, Hersman said. "He advised our team that he got approximately two hours of sleep," Hersman said. It was the latest revelation in an investigation that has raised numerous questions about human error. Hersman said earlier this week that the plane crashed after veering down a wrong, shorter runway when the controller turned his back to handle administrative duties. The controller, a 17-year veteran whose name has not been released publicly, worked from 6:30 a.m. to 2:30 p.m. on Saturday. He came back to work at 11:30 p.m. on the same day to begin an eight-hour overnight shift. Federal Aviation Administration spokeswoman Laura Brown said the air traffic controller union approved the work schedule rules, and the FAA provides information about how to avoid fatigue. "If they don't believe they're fit for duty, they're supposed to tell us that," Brown said. "You won't be penalized for not reporting for work." The $18,000 equipment system, which can pinpoint a plane's location using global-positioning systems, also alerts pilots if they are trying to take off from a taxiway instead of a runway. The software program an enhancement to Honeywell's widely used ground proximity warning system that alerts pilots to mountain peaks ahead costs about $18,000 a plane. It was developed in response to Federal Aviation Administration concerns over runway accidents and close calls. Meanwhile, CBS News correspondent Bob Orr reports that 45 minutes before Comair Flight 5191 crashed in a fireball, the pilots made their first error. They boarded the wrong plane and fired up its generator. At the time it seemed a harmless mistake, but investigators now wonder if that was sign the pilots were not fully focused on details. The black boxes pulled out of the charred wreckage also suggest once they got in the right plane the pilots were in a hurry. The captain mistakenly taxied the plane a very short distance onto the wrong runway. With no other plane to hold up them up, the Comair crew never hesitated or double-checked their position. They immediately turned off the taxiway and began roaring down runway 2-6 having no idea the plane was on a crash course. And the lost pilots got no help from the air traffic control tower, Orr reports. In unfortunate timing, the controller cleared Comair for take off and then turned his back to take care of paperwork. Investigators say the controller did nothing wrong. But his actions eliminated any chance he had to warn the pilots of their fatal mistake. The crash threw a spotlight on another practice aviation experts say goes on around the country: Small regional airports are sometimes manned by a single air traffic controller, even though federal rules require two. The FAA has directed Blue Grass Airport and others like it to staff their towers with at least two controllers. 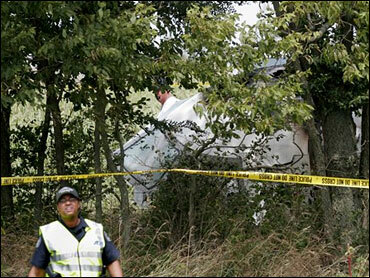 But the FAA has acknowledged that only one was working Sunday in Lexington during the crash. Ken Spirito, director of a regional airport in Peoria, Ill., said it is common for some late-night and early-morning shifts to be staffed with only one controller. Someone may call in sick or take a vacation, and the FAA usually decides to keep the airport open, he said. "The mandate that is issued by FAA is only as good as the staffing levels at that particular tower," Spirito said. FAA spokeswoman Laura Brown said that at the time of the accident, there were only two other towers — in Duluth, Minn., and Fargo, N.D. — that were not following the policy to staff with two controllers. "We have clarified the guidance for them," Brown said. The lone survivor of the crash, first officer James Polehinke, remained hospitalized in critical condition. Also Wednesday, six tour buses took the victims' families to the crash site for the first time. The airport also established a memorial in a parking lot, featuring a banner reading "Remembering 5191" with pens for people to write messages. Comair offered to pay $25,000 per passenger to each family who lost a loved one. Meanwhile, law firms lined up to represent families who may want to sue. "We understand that no monetary relief can overcome the grief of losing a loved one," Comair spokeswoman Kate Marx said. "But we also recognize there likely will be additional financial demands at this difficult time, and we hope this form of assistance can help alleviate some of the immediate financial pressures."